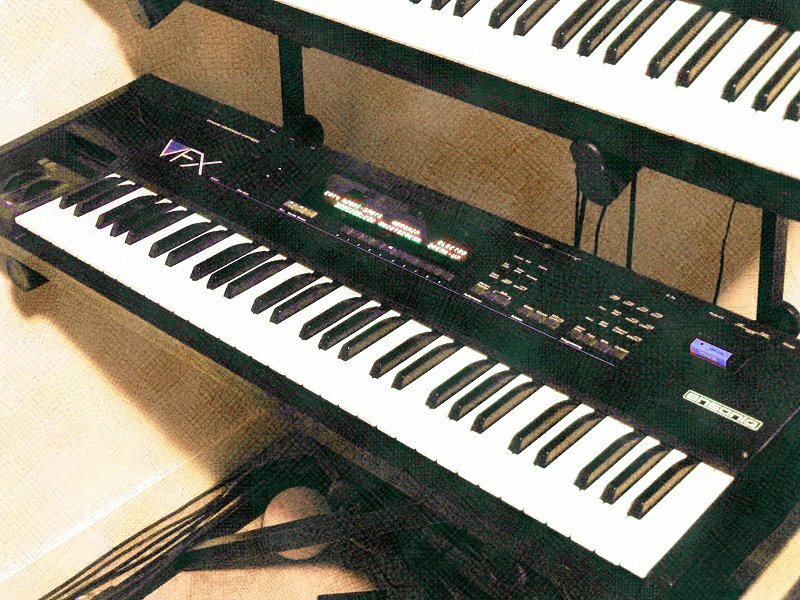 The Ensoniq VFX - "Vintage Digital"
A recent discussion got me thinking about older synths that are overlooked, still very powerful and available dirt-cheap these days. The one that came first to my mind is the wonderful Ensoniq VFX released back in 1989. It was the synth that followed up their hugely popular ESQ-1 and SQ-80 models and had more "features" but has now faded to general obscurity. Its current disfavor probably stems from the fact that it was Ensoniq's first all-digital synth and the User Interface looks rather uninviting - a forgivable misconception as you will soon see. The architecture is suprisingly flexible and powerful, even by today's standards, for a synth manufactured in the late 80s. Each patch consists of up to six oscillators based either on sample-playback or PPG-style scanned-wavetables. Each one of those oscillators has its very own signal chain consisting of Dual filters (LPF and/or HP), three flexible multi-stage envelopes, noise, an LFO, VCA and lots of modulation routings including a flexible "modulation mixer" implementing an Oberheim-like tracking generator to waveshape various modsources. Capping off each 6-osc patch was a multi-FX processor fully integrated into the synth engine - you could do things like sweep the flanger with an envelope or modulate delay time with an LFO, syncing FX to the rest of the synthesizer - this was an Ensoniq "trademark" feature that they continued in their subsequent synthesizers. The VFX features 21 voice polyphony which was pretty reasonable for its time - since there's usually only two or three oscillators going at one time in a patch you've usually got a good eight voices of polyphony to play with. Each patch is essentially a "multi" unto itself with up to six layers! There are, however, a few things that date the synth, like the fact that the sample memory is very limited by today's standards (though what's there sounds surprisingly good and varied), the drum samples are an "80s cliche", and the filters are non-resonant(!) but, as you'll see, there is at least one surprising workaround for that last issue. 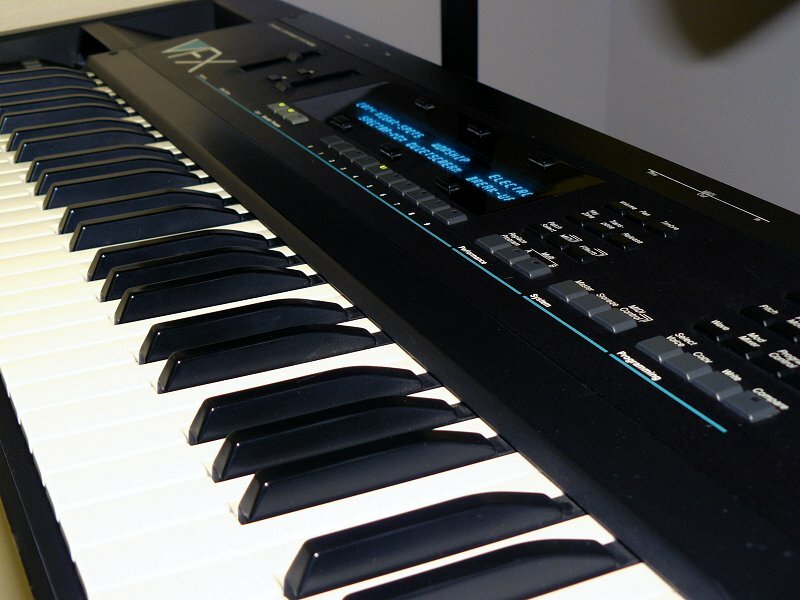 The VFX was a contemporary of the Roland "LA" synths like the D-50 and shares the idea of assembling sounds from various sampled attack transients (like the scrape of a violin bow or a pot lid being struck with a spoon) and looped sustaining "body" sounds (like strings or panflute). There are basic synthesizer waves available as well for more "classical" synth fare if you prefer. You'll find some interesting "inharmonic" loops as well for timbres that are traditionally very hard to synthesize. There's even an obligatory Piano multi-sample in there too that, while not especially realistic, sounds great in a mix and can really "cut through". A big part of the charm of the VFX's sound for me was the fact that the VFX had 17 wavetables that could be chosen as oscillators in addition to the sample playback ones described above. 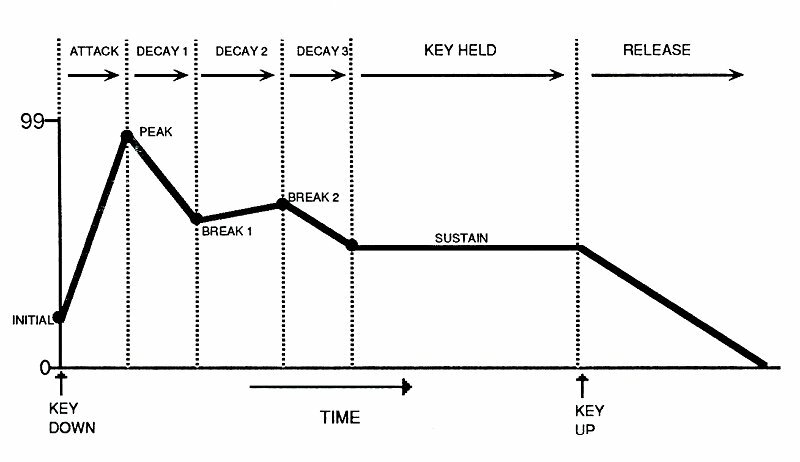 Ensoniq called their wavetables "Transwaves" - each one made up from 100 usually-harmonically-related single-cycle waveforms that can be "scanned through" by a modulator during the duration of a single note, allowing for timbral sweeps not available through any other synthesis method. Here's where the "workaround" for the filters' lack of resonance comes in - there were four transwaves dedicated to simulating a resonant filter being swept by a modulator...and, surprisingly, it works fairly well! The programming interface is pure 80s, though more refined than some (DX7 anyone?) - first a page of parameters are selected via buttons to the right of the display. Parameters that have more than one page have a symbol next to the button showing that fact. Multiple button presses walk you through all the available pages. Fortunately there's usually no more than two "sub pages". When a page of parameters is selected, it shows up on the old-school electroluminescent display, then multiple parameters can be edited at once. There are six soft buttons around the display used to select the active parameter you're editing. Just to the left of the display is a data entry slider and two increment/decrement buttons for changing the values. The fact that you can edit multiple parameters at once and the parameter pages are grouped logically saves this board from being too tedious to edit and, with practice, its a reasonably fast and relatively painless system. In patch selection mode, each of the ten numbered buttons below the display selects a bank of six patches. The soft buttons around the display now select which patches will sound. One cool thing about the VFX is that multiple patches can be stacked on the fly just by double-clicking additional patch select buttons, and the patches can be from different banks as well - the downside is that this eats up the VFX's polyphony quickly though it sounds incredibly massive. There are 60 User patches stored internally, 60 ROM patches stored internally and cartridge patches selectable if you have a patch cartridge plugged into the machine - these are selected by the buttons to the left of the number buttons under the display. Have a look at the block diagram above - it shows the signal path for a single oscillator in a patch but, remember, you can create patches with up to six oscillators so its easy to get a lot happening with just a few oscillators going at once. There are two "patch select" buttons positioned in easy reach just above the mod and pitch wheels that allow you to change which oscillators are playing in a patch so while you're performing you can bring in different timbres or radically alter a patch with ease. 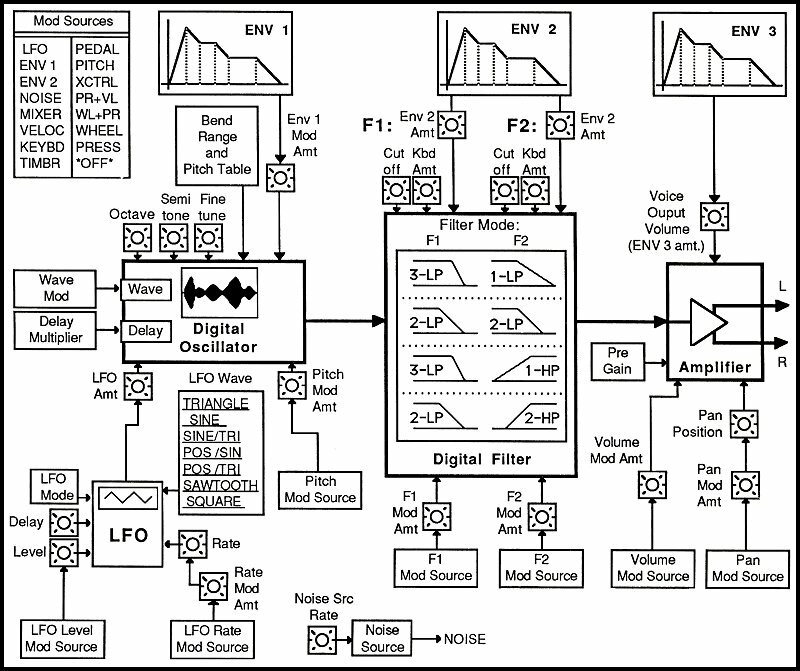 Each oscillator can be modulated by three multi-stage envelopes (5 rate/5 level) that are initially hard-wired to pitch, filter cutoff and volume. These assignments can be rerouted to other destinations if you want and the envelopes can be looped or set as one-shots. So if you're not using envelope 1 for pitch modulation, you can route it to wavetable position of a "transwave", flanger speed or you-name-it! Its this flexibility that allows someone willing to "get their hands dirty programming" a huge variety of fresh and interesting sounds. As well as being a "programmer's synth", the VFX is a "performance synth" as well. There are features like the patch select buttons I mentioned before and plenty of pedal inputs but the nicest feature in this regard is the polyphonic aftertouch keyboard! Unlike regular aftertouch that has one value regardless of which key you press, polyphonic aftertouch reacts per-key so you can hit a chord and sort of "dig in" with your fingers altering single notes in the chord. Poly-AT is great routed to LFO pitch modulation amount - when you have sustaining bass notes you can introduce vibrato on just the high notes alone just by applying a little more pressure to them. Its also great routed to cutoff for amazing "morphing" dynamic pads controlled just by finger pressure. Hopefully this little description will pique some people's interest enough to investigate this "lost jewel" of a synth a little bit further. Current prices for the VFX are usually under $300. There is only one "gotcha" I know of for the VFX - some early models suffered from "keyboard calibration error" on powerup caused by a ribbon connector between the two halves of the keyboard sensor failing - its easily repairable by a tech just by "hardwiring" the connection. A majority of the VFXs still "alive" these days have had this fix but its something worth checking if you're planning on buying one! Regardless, I can't think of a board on the used market that offers more synthesis power for such a small price. Places like Syntaur Productions still provide support for the VFX in the form of manuals and patches, and The Soniq is a great source of parts and repairs if needed. There's also a VFX Forum.